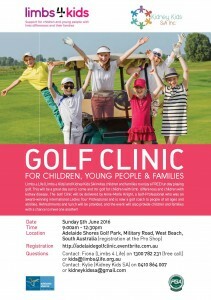 Limbs 4 Life (Limbs 4 Kids) in conjunction with Kidney Kids SA is holding a FREE ‘Children’s Golf Clinic’ at the Adelaide Shores Golf Club in Adelaide (South Australia) on Sunday the 5th of June (9am – 12.30pm). This event is being run by a golf professional, Anne-Marie Knight, who very experienced at giving children an opportunity to ‘try golf’. This event is specifically for children / young people with limb difference or chronic kidney disease (and their siblings). It will be a fun day with lots of opportunities for children and families to meet and have fun, and a yummy lunch after the golf clinic!